Kate Parker is afraid. Not just of things that go bump in the night but of riding her bike on the road, getting breast cancer from drinking one too many glasses of wine, letting her son walk to the shops on her own. Everything she does is weighed up, considered against a never ending loop of statistics that run through her head. It started when her parents died. Got worse when her husband was killed. Now, it’s out of control and ruining her and her son’s life. She knows she has to do something – her mother-in-law is one breath away from calling social services – and a chance meeting with an Oxford professor seems to provide the solution. He understands statistics and promises to help her by helping her take risks. The question is, are the risks worth taking? I’d really been looking forward to reading this book because I’d enjoyed Louise Millar’s debut, The Playdate, which came out a couple of years ago. 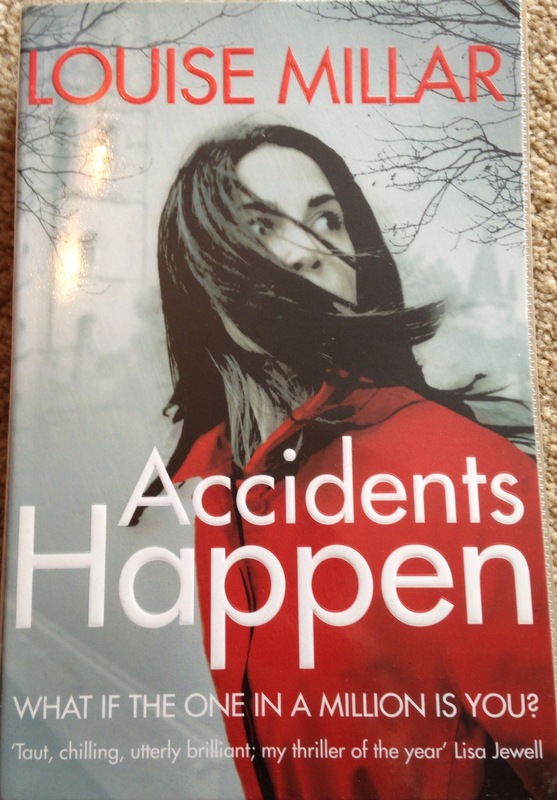 And I did enjoy Accidents Happen, just not as much as I had hoped I would. What I liked was Millar’s writing style, which is really easy to read without being overly simplistic. It suits the type of book and was perfect for me actually this week as it was a long one at work and I didn’t have many brain cells left over. The story itself had plenty of twists and turns and suspenseful moments. There were times when I found I had been holding my breath waiting to see what would happen next. The problem, though, and why I can’t quite go to 4 out of 5, was that I just didn’t like Kate. I understood why she was so paranoid and behaved the way she did but, at the same time, I didn’t. Because it was so obviously hurting her son and she so quickly gave up on professional help. I know she had to to keep the plot moving but it irked me and I couldn’t get past it. It took away my sympathy and it never came back. For me, I have to identify with the characters. I have to love them or hate them. Spending my time irritated by them doesn’t work. It distracts me. I know that’s not the same for everyone and so I wouldn’t not recommend this book, just not to the people I know have the same reading tastes as me.